We give you the communication edge. We know why you’re here. Let’s face it. Your high-potential associates can have the business experience and technical skills to lead your industry or domain area, and still not be seen, heard, viewed as “strategic” or polished enough to lead the charge or take that next step. Or, maybe they’re less comfortable with certain audiences or situations. LeVan Partners offers more than tips and tricks. We give you both the communication strategy and skills to drive the kind of business results that lead to professional success. We’ve been doing it since 2003 for some of the most premier financial trading institutions, manufacturing, healthcare and pharmaceutical companies, research, insurance and consulting firms. We’ve helped CEO’s, CFO’s, CAO’s and CIO’s get to where they are today. Our methodology is favored by top Fortune 500 global corporations, and our communication training has been used as part of executive development programs from Harvard and the Kellogg School of Management. 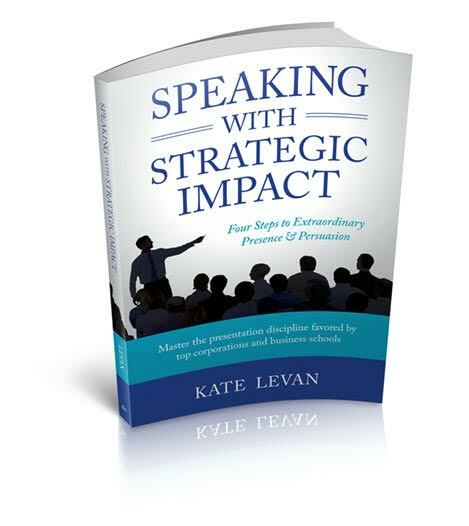 To understand the Way we do it, you can learn more about our proven approach in Speaking with Strategic Impact: Four Steps to Extraordinary Presence & Persuasion by Kate LeVan. Who Kate and her partners are? Kate recently spoke with Will Barron on his international ‘Salesman Podcast’ about a process for creating a more impactful sales pitch. Kate recently had a conversation with Ellen Rogin of Advisor Radio on “Giving Your Presentations the Impact of a Ted Talk”.